Two days before the race I find myself sitting in the Nelo van with Andre, Henrique and Manuel Busto heading north to Benidorm with the trailer behind us loaded with ski’s. The wind is howling blowing at around 15-20 knots. After putting on all the warm gear we have (not much as this is the Mediterranean and should be warm) we are immediately in some good cross runs heading out to the island. The 11km from Benidorm back to Villajoyosa in these conditions are as good as you would get anywhere around the world! Heaps of fun. 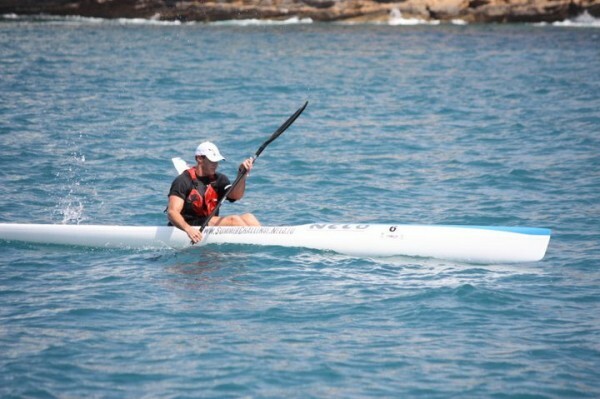 Come race day, nothing like that, we had 14km of upwind paddling into a light 5 knot breeze heading up to Benidorm and our turning buoy. Not all was lost though as the wind was blowing in our face on the way up and should be at our backs on the way home…....not to be. The wind did a magic trick and disappeared to make it a grind the whole way home. Sean Rice lead from start to finish with Hank and Jasper on his wash with myself and Dawid always 50-100m behind heading to Benidorm. After the island I paddled my way up to second on a more inshore line with Sean still out in front. Coming into the last 3pm the boys on the outside had managed to fight back and found something in their water to bring them home over the top of me. No one was ever going to catch Sean today and he raced really well. Dawid powered into second with Hank third, Jasper fourth and myself fifth. It was a bloody hard race in conditions that made 25km seem even longer. As the race finished and we were enjoying lunch, the wind came up! As I am writing this looking out the window the wind is blowing in the same perfect direction as the swell for a paddle back from Benidorm. Unbelievable!